The Beta Nu Chapter of Phi Mu Alpha Sinfonia sponsored the annual concert called "Sinfonian Dimensions in Jazz". January 12-13, 1968 marked its 18th concert. Performing at the concert was the Jazz Ensemble, directed by James A. Coffin, and the Jazz Chorus, directed by Denny Vance. The guest musician was Clark Terry on the trumpet. 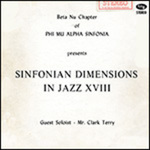 A recording of the Beta Nu Chapter of Phi Mu Alpha Sinfonia sponsored annual concert called "Sinfonian Dimensions in Jazz". January 12-13, 1968 marked its 18th concert. Performing at the concert was the Jazz Ensemble, directed by James A. Coffin, and the Jazz Chorus, directed by Denny Vance. The guest musician was Clark Terry on the trumpet. "Mumbles" (1968). Sinfonian Dimensions in Jazz. 22.